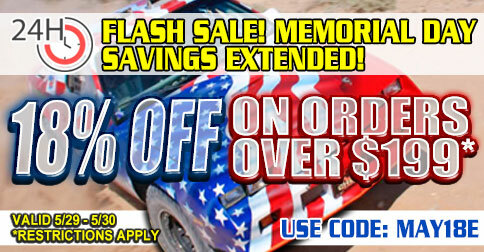 Memorial Day Sale Extended! 18% Off Orders Over $199! Home>Memorial Day Sale Extended! 18% Off Orders Over $199! Missed out on our weekend sale? don’t worry, We are giving you another chance to save! Save up to 35% off when you use this coupon! Use coupon code MAY18E* to get a additional 18% off our already low prices! on all qualifying orders over $199! MAY18E expires on 05-29-18 at 6:00pm est. *For 18% offer to apply the order total must be $199.00 or greater. 18% off coupon only applies to items marked as Part eligible for discounting: Yes (Discounting information can be found on the product description page for all parts). If your basket contains a mixture of items marked as both Yes and No for eligible for discounting your order total will be reduced to reflect any items set to Yes for “Part eligible for discounting: Yes”.